“Hard Truths: 18 Rock Solid Lessons for Leaders” by Michael Tomlin was written for people in leadership positions, however, I feel that it offers a lot of great advice for all audiences. The author uses his life experiences, from a variety of careers in leadership, including the military, plus the school of hard knocks, to provide valuable information to readers. Divided into 18 chapters, each with their own topic, I found them all to be of great value. I especially liked the chapter that addresses image, because I think that it is critical for leaders to realize that their subordinates are watching them to either judge them or learn from them. The more polished the presentation, the better the employees will be able to perceive them as a leader. This also applies to those of us who work in education. Students need leaders to learn from and to emulate. My second favorite area was on discipline. The author offers wise words that made me take a look at how much time I waste when I am not focused and disciplined. When I am undisciplined, I sacrifice time off my life because I am engaging in wasteful, unproductive activities. This also applies to my personal life! I could keep going on about what I learned, but it would cover lessons from every chapter! 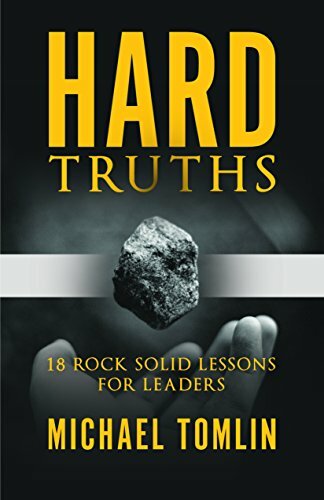 “Hard Truths: 18 Rock Solid Lessons for Leaders” by Michael Tomlin is written in an engaging manner so that it is both enjoyable and educational. As mentioned previously, it is of great value to readers in leadership positions, but I would also recommend it to new college graduates, and those who just want to improve their lives in general. People who work in all aspects of life including military, education, and business will benefit from the information presented. I would also recommend journaling your thoughts as you read. Normally, I suggest fictional books for reader’s groups, but in this case, I make an exception – “Hard Truths” would certainly make for interesting discussions. It will make a great gift as well. I am going to give a copy to the new dean at my college!